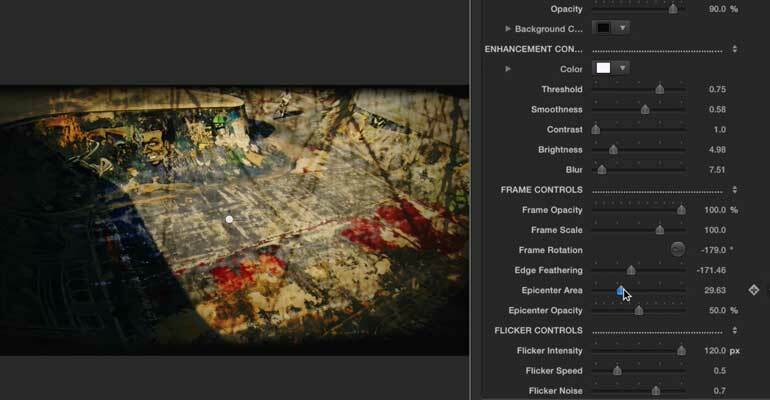 Scratch up any media using FCPX Overlay Scratches 5K’s intuitive grunge overlays. Simply drag title layers into the FCPX timeline on top of footage to apply. FCPX Overlay Scratches 5K comes packed with thousands of sample frames spread throughout 10 ranges of scratch material for users to take advtantage of. Effortlessly create dynamic grunge effects, or subtle lens scratches in no time. 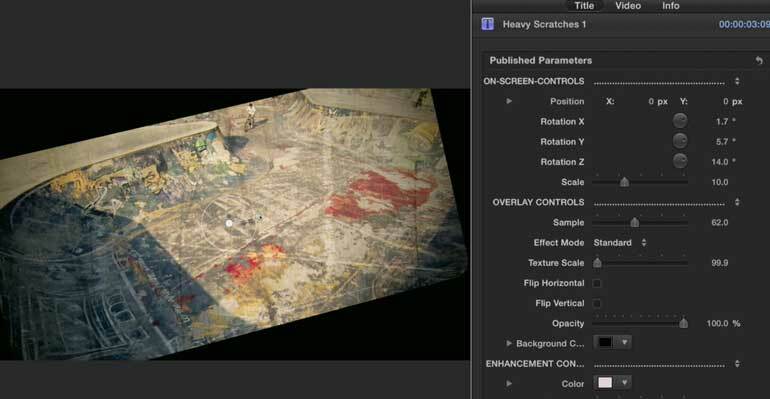 FCPX Overlay Scratches 5K is a Final Cut Pro X exclusive. Learn how to create and customize your very own professional scratch overlays with the FCPX Overlay: Scratches 5K Lesson. Let’s begin by selecting our media from the FCPX Media library and dragging it to the timeline. Then locate FCPX Overlay Scratches in the titles library. 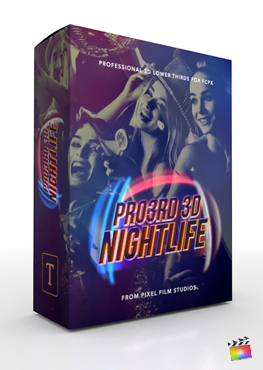 Browse through the variety of Scratch presets. For this example we will be using the heavy scratches 1 preset. Drag and drop the preset over the top of your media. Make it the same length as your media. Select the adjustment layer and go to the Inspector Window. Let’s start by adjusting the position, rotation, and scale in the on-screen controls section. 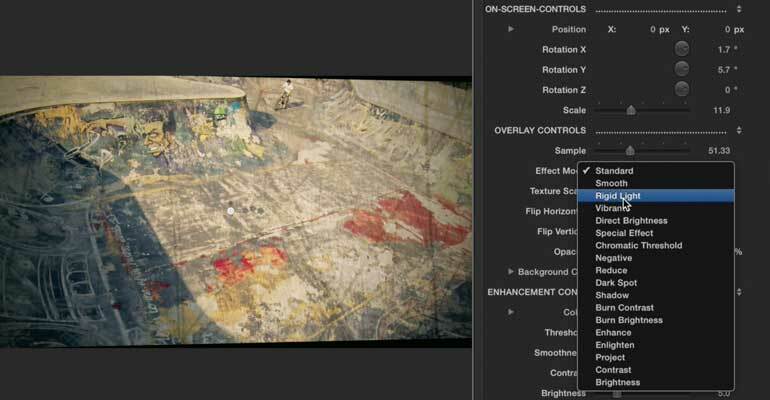 You can make these adjustments using the designated sliders or you can use the on-screen controls in the viewer window. Adjust position by clicking and dragging the center control puck. Each arrow will adjust a different rotation. Click and rotate the inner arrow to adjust the X Rotation. To adjust the Y Rotation click and rotate the middle arrow. Click and rotate the outside arrow to adjust the Z Rotation. Once you have the on-screen controls set move down to the Overlay Controls section. Begin by adjusting the sample slider. The Sample slider will cycle through different scratches. After choose a variety of Effect Modes. Then go on to adjacent the texture scale. Underneath you have the option of flipping the scratch texture horizontal or vertical. Continue on by adjusting the opacity of the texture and selecting a background color. Next we will go over the Enhancement Controls. Start by selecting a color. Once you have chosen a color you can then adjust the threshold, and smoothness sliders. The Threshold slider will determine what is light and what is dark in your image. Move the threshold slider left to make your adjustments lighter and move the threshold right to darken them. Adjusting the smoothness slider will set the smoothness of transition between the substituted colors chosen. Then go on to adjust the contrast, brightness and blur. After you have adjusting the Enhancement Controls go down to the Frame Controls. 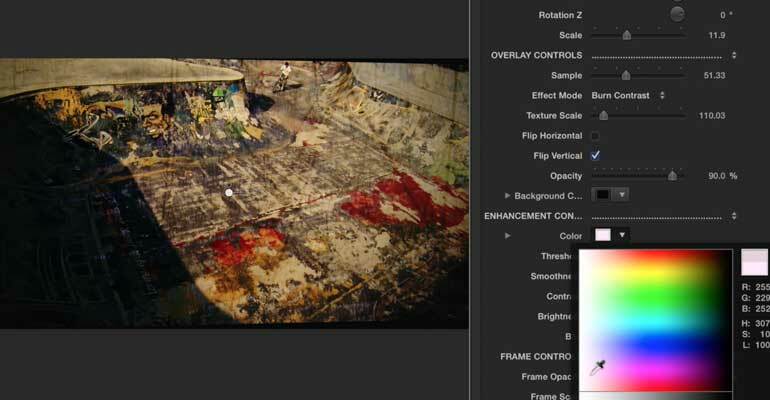 Begin by adjusting the frame opacity, frame scale, and frame rotation. Then adjust the Edge feathering slider. Lastly adjust the Epicenter area and Epicenter opacity slider. The Epicenter area slider acts as a vignette. Moving the slider the left will decrease the cover less of your media, While moving the slider to the right will cover more of your media. Next adjust the Epicenter opacity. Now for some final touches. 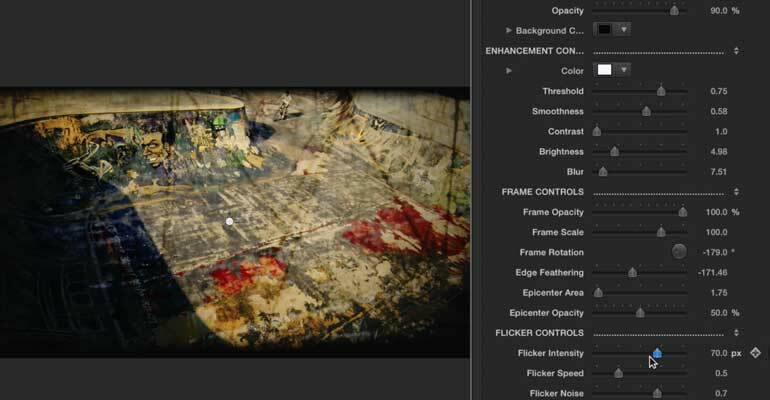 In the flicker controls you can adjust the flicker intensity, flicker speed and flicker noise sliders. 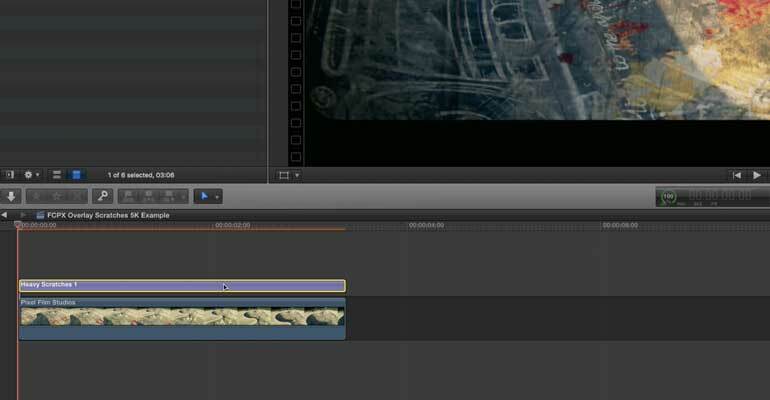 Where do I find FCPX Overlay: Scratches 5K? Once the installation is complete, you can find FCPX Overlay: Scratches 5K in the FCPX Title library.